The Family and Community Services NSW Practice Framework was launched in September 2017. 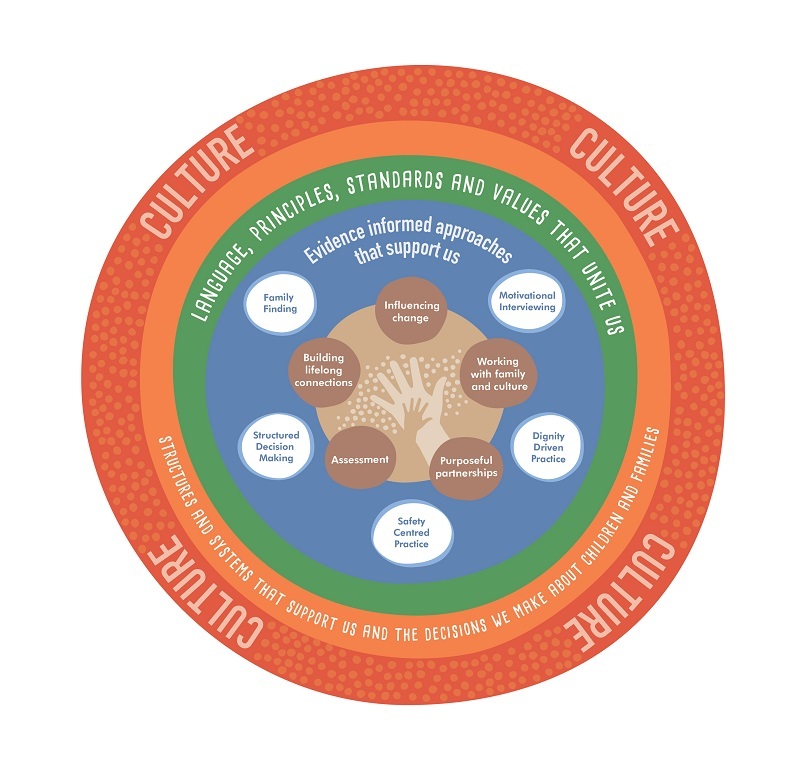 The Framework shows how FACS works with children and families in NSW. It includes the principles, values, mandates, approaches and systems that underpin our work. A text alternative to the NSW Practice Framework infographic is available. For families, it shows you what you should expect when you work with a caseworker and or another FACS employee. The Framework places children and young people at the centre of our decisions and practice and asks caseworkers to build relationships that lead to positive change for families. For our NGO partners, the Framework shows our commitment to be accountable for our decisions and actions and to be honest, consistent and impartial in our work. It articulates that partnering work with community partners are a core system needed for good outcomes for children and families. Service - We put people at the centre of everything we do. Integrity - We act professionally with honesty, consistency and impartiality. Trust - We build relationships based on mutual respect. Accountability - We take responsibility for our decisions and actions. Relationships create change and restore dignity. Critique leads to improved practice. Ethics and values are integral to good practice.